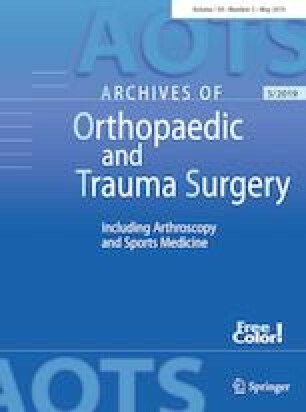 To assess the infection eradication rate when using two types of articulating spacers (prosthetic articulating spacers and all-cement articulating spacers) in two-stage revision of infected total knee arthroplasty (TKA). We comprehensively searched PubMed, Embase, and the Cochrane Library databases and performed a systematic review and meta-analysis of retrospective comparative studies assessing two types of articulating spacers. A quality assessment of the included studies was performed following the STROBE statement. Thirty retrospective studies, including a total of 821 knees, were identified. The pooled infection control rates in stage I were as follows: 0.98 (95% confidence interval [CI], 0.97 to 1.00) and 0.98 (95% CI, 0.96 to 0.99) for the prosthetic articulating spacer group and all-cement articulating spacer group, respectively. The pooled postoperative reinfection rate was 0.05 (95% CI, 0.03 to 0.08) for the prosthetic spacer group and 0.03 (95% CI, 0.01 to 0.06) for the all-cement spacer group. Results of the subgroup analyses showed that the weight of the antibiotic cement, antibiotic type, mean period of spacers in situ, postoperative antibiotic treatment period, and postoperative antibiotic treatment approach had no effect on the reinfection rates (p < 0.05). Compared to all-cement articulating spacers, articulating spacers containing bio-inert materials have a similar infection control rate but a higher postoperative reinfection rate. Although the 95% CIs of reinfection rates in the two groups overlapped, our results indicate that articulating spacers containing bio-inert materials may be associated with higher reinfection rates and poorer clinical outcomes than all-cement articulating spacers. We acknowledge Professor Jing Tian for selecting the topic and offering valuable suggestions. His instruction was a great help for the completion of our study. There is no funding source.